While public transport, cars, and bikes are great for getting where you need to fast, it doesn’t do much in the way of sightseeing. In order to really get to know a place you must explore it, and the best way to explore any town or city is to walk it. Brisbane is a well structured city that makes for easy access to most places, but even so there’s some worthwhile sights missed when you don’t explore the city on foot. Outstanding sights include City Hall, the Treasury Casino, Queens Gardens and the Old State Library, all of which can be found with just a little knowledge of the city. Don’t know it very well? Consider taking a guided walking tour to really get to know Brisbane. Guided walking tours take you places off the main tourist map and allow you access to inside secrets. They really are the best way to learn everything you could want to know about Australia’s third largest city. Another wonderful thing about walking tours is that many of them are free. 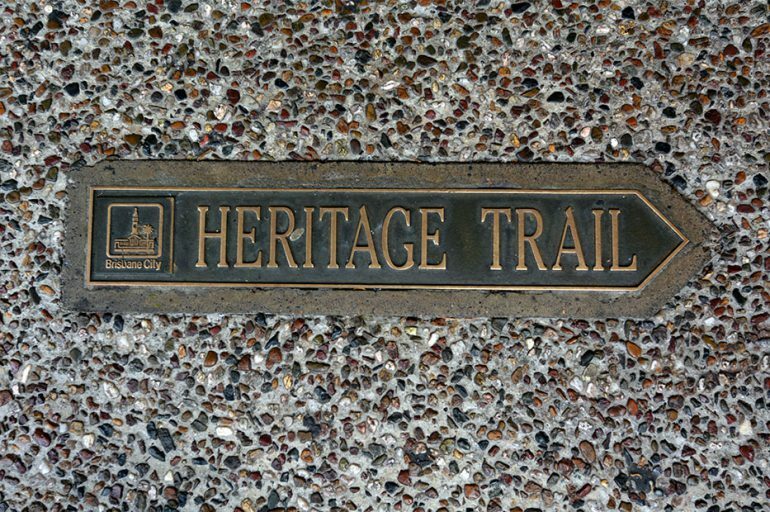 Winding along the riverfront areas of Brisbane’s CBD, the Brisbane City Council’s Reflections on the River heritage trail gives residents and visitors some insight into how the Brisbane River has played a role in the city over the years. You can download the free trail brochure from the City Council’s website. Boondall Wetlands – Walk along the Aboriginal Art Trail at Boondall Wetlands and you’ll discover 18 aluminium sculptures which depict how Aboriginal clans used the land, flora, and fauna of the wetlands. Contact the council to receive your free map. Peace Park, Nashville – Focusing on the area’s Aboriginal food sources, the 250 metre circular trail at Peace Park, Nashville features hand-painted and carved totems depicting plants and animals. Mt Coot-tha – Showcasing Aboriginal art in its natural setting, the Aboriginal Art Trail at Mt Coot-tha displays how art can be used to map the land. Set over 1.5 kilometres, the trail features eight artworks and interpretation signs are provided at each location. The Vibrant Valley Heritage Trail takes you on a journey through history to discover how the Fortitude Valley was shaped. Learn how the Valley rose to become one of the city’s best-loved commercial and retail centres, and how the region became one of the first areas to welcome the Chinese, lesbian and gay community. You can download the Vibrant Valley brochure from the City Council’s website. Discover 18 points of interest along the Ample About Albion Heritage Trail, which starts from the Albion Hotel and ends in Crosby Park. Learn about early European settlement, wartime activity during World War II, and Albion’s prominence as an industrial centre. Download the free Albion Heritage Trail brochure from the City Council’s website. Visit the Brisbane Visitor Information Centre, located in the Queen Street Mall outside Wintergarden, and from 12 noon Monday to Friday you can join a free guided walking tour. Visit sights such as the Botanic Gardens, Old Government House, the Brisbane Arcade, and the Old State Library. For just $39, you can enjoy an indulgent, educational stroll around the city, stopping at four different venues renowned for their decadent chocolate. Over 2.5 hours you can sample chocolates, learn the making processes, and shop with a tour discount. You’ll even be given a mouth-wateringly good hot chocolate mid tour. Bookings are essential for the Chocolate Walking Tour. According to National Geographic, Brisbane is the second most haunted city in the world, packed full of ghosts and horror stories. Catch a sighting or listen to a tale as you walk the 1.5 hour Haunted Brisbane Tour that takes you through the heart of the city. The unique tour, which costs just $20, takes you through the Brisbane Arcade and explores real life ghosts stories, a haunted lift, a scary church, and a possessed press. Bookings essential. It’s incredible how many dessert houses are hidden from sight, with the city’s nooks and cranny’s playing home to some of the best patisseries around. Over three hours during the South Bank Dessert Tour, you’ll enjoy sugary goodness from no less than five venues while being given the opportunity to speak with the talented makers. You can’t feel bad about eating sweets when you’re on a walking tour! Tours cost $49 per person, and bookings are essential.